Each of these entries are described in more detail in this section. 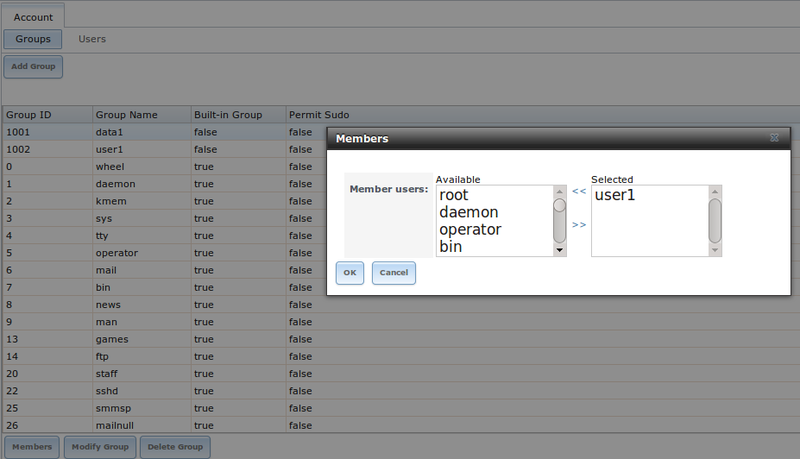 The Groups interface allows you to manage UNIX-style groups on the FreeNAS® system. if a directory service is running on your network, you do not need to recreate the network’s users or groups. Instead, import the existing account information into FreeNAS®. Refer to Directory Service for details. This section describes how to create a group and assign it user accounts. The next section will describe how to create user accounts. If you click Groups ‣ View Groups, you will see a screen similar to Figure 4.1a. All groups that came with the operating system will be listed. 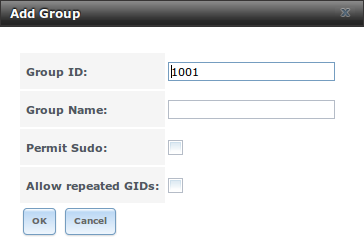 Each group has an entry indicating the group ID, group name, whether or not it is a built-in group which was installed with FreeNAS®, and whether or not the group’s members are allowed to use sudo. If you click a group entry, a “Members” button will appear. 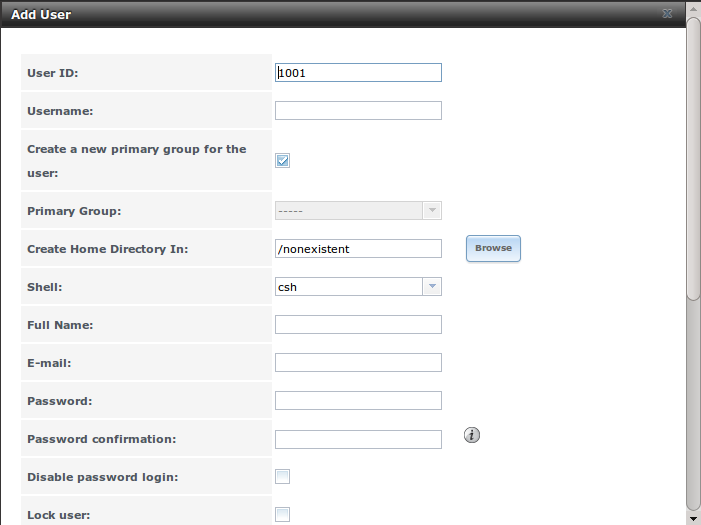 Click this button to view and modify that group’s membership. If you click the “Add Group” button, you will see the screen shown in Figure 4.1b. Table 4.1a summarizes the available options when creating a group. Once the group and users are created, you can assign users as members of a group. Highlight the group you wish to assign users to, then click the “Members” button. Highlight the user in the “Member users” list (which shows all user accounts on the system) and click the “>>” to move that user to the right frame. The user accounts which appear in the right frame will be added as members of that group. In the example shown in Figure 4.1c, the data1 group has been created and the user1 user account has been created with a primary group of user1. The “Members” button for the data1 group has been selected and user1 has been added as a member of that group. To delete a group, click its “Delete Group” button. The pop-up message will ask whether or not you would also like to delete all members of that group. Note that the built-in groups do not provide a “Delete Group” button. Create a guest account that all users will use or create a user account for every user in the network where the name of each account is the same as a logon name used on a computer. For example, if a Windows system has a login name of bobsmith, you should create a user account with the name bobsmith on FreeNAS®. If your intent is to assign groups of users different permissions to shares, you will need to also create groups and assign users to the groups. If your network uses a directory service, import the existing account information using the instructions in Directory Service. 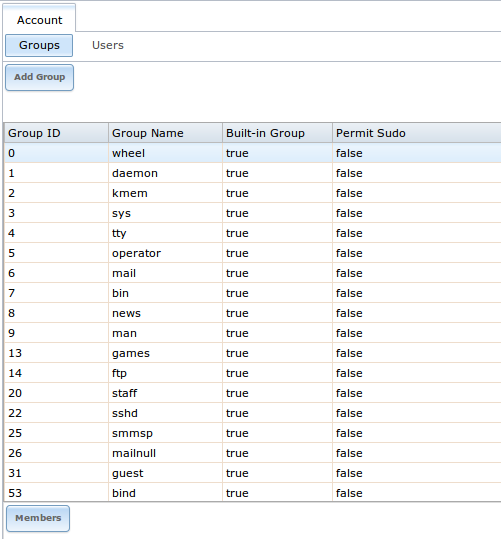 Account ‣ Users ‣ View Users provides a listing of all of the system accounts that were installed with the FreeNAS® operating system, as shown in Figure 4.2a. Each account entry indicates the user ID, username, primary group ID, home directory, default shell, full name, whether or not it is a built-in user that came with the FreeNAS® installation, the email address, whether or not logins are disabled, whether or not the user account is locked, whether or not the user is allowed to use sudo, and whether or not the user connects from a Windows 8, 8.1, 10, or higher system. To reorder the list, click the desired column name. An arrow indicates which column the view is sorted by; click the arrow to reverse the sort order. Modify User: used to modify the account’s settings, as listed in Table 4.2b. Every account that came with the FreeNAS® operating system, except for the root user, is a system account. Each system account is used by a service and should not be available for use as a login account. For this reason, the default shell is nologin(8). For security reasons, and to prevent breakage of system services, you should not modify the system accounts. To create a user account, click the “Add User” button to open the screen shown in Figure 4.2b. Some settings are only available in “Advanced Mode”. To see these settings, either click the “Advanced Mode” button or configure the system to always display these settings by checking the box “Show advanced fields by default” in System ‣ Advanced. Table 4.2a summarizes the options which are available when you create or modify a user account. Password string mandatory unless check box “Disable password login”; cannot contain a ?